Department VA jobs Recruitment 2018. Mode of application is online for this Chikkamagaluru Village Accountant jobs. Candidates can apply online from 30-07-2018 to 29-08-2018. 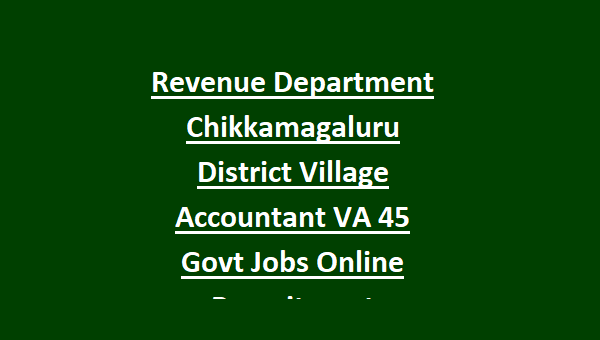 Apply online through the Revenue Department official website of http://chikmagalur-va.kar.nic.in/. Those who qualified 12th class they can apply online for VA jobs. You have to apply online only for these VA jobs. Candidates selection is based on interview for this Chikkamagaluru District Village Accountant VA jobs. Detailed information about this Chikkamagaluru District Village Accountant VA jobs selection process, exam pattern and syllabus qualification and other details are given below. 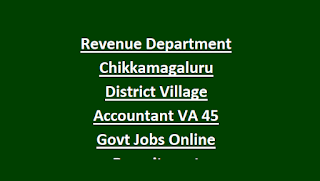 There are total 45 jobs in this Revenue Department VA Chikkamagaluru District recruitment. Category wise Village Accountant vacancies are given below. Candidates must have qualified 12th class for applying these Village Accountant vacancies of Chikkamagaluru district. Age limits for these VA jobs is 18-35 years for general candidates. For SC, ST,Cat 1 age limits are 18-40 years and for all other categories age limits are 18-38 years. Selection for these Village Accountant will be held through merit in 12th class exam. Merit list will be displayed in official website of http://chikmagalur-va.kar.nic.in/. Apply online for this Chikkamagaluru District Village Accountant jobs from 30-07-2018 to 29-08-2018 through official website of http://chikmagalur-va.kar.nic.in/.